Dentists use a procedure called a root canal to remove infected or inflamed pulp within a tooth and prevent tooth loss, explains the American Association of Endodontists. The dentist drills into the tooth to expose the pulp inside. Once the dentist clears the inside of the tooth of the affected pulp, she cleans the inside of the tooth to remove any lingering bacteria and fills the hollow space within the tooth. Sometimes the dentist leaves the tooth open for several days to allow any infection to drain completely before filling it, notes the Mayo Clinic. The dentist may also pack the interior of the tooth with medication to clear up an existing infection. If the dentist cannot complete the root canal in a single session, she places a temporary filling in the tooth to protect it from food particles, saliva and bacteria. The dentist may prescribe oral antibiotics depending on the severity and location of the infection. After the dentist fills the tooth with a rubber compound and sealer paste, the dentist places an artificial tooth, called a crown, over the treated tooth, explains the Mayo Clinic. With the root canal complete, the tooth functions as it did before the infection. Tooth decay, a cracked or chipped tooth, or multiple procedures on the same tooth can allow the tooth's pulp to become infected, according to the Mayo Clinic. Without a root canal, the inflamed tooth could cause a serious infection, pulp death and bone loss. What Does a Dental Root Canal Procedure Entail? 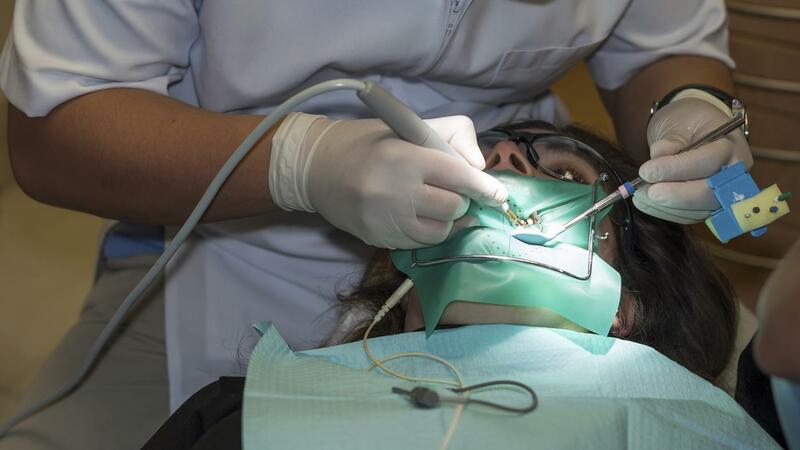 What Is the Average Price for a Root Canal? Can Fake Teeth Be Whitened? What Could Cause Tooth Pain When Biting Down? What Causes Nerve Pain in Teeth?